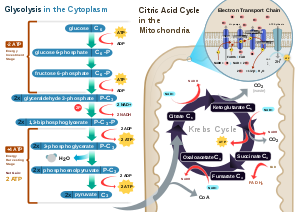 Cellular respiration is a set of metabolic reactions and processes that take place in the cells of organisms to convert biochemical energy from nutrients into adenosine triphosphate , and then release waste products. The reactions involved in respiration are catabolic reactions, which break large molecules into smaller ones, releasing energy in the process, as weak so-called "high-energy" bonds are replaced by stronger bonds in the products. 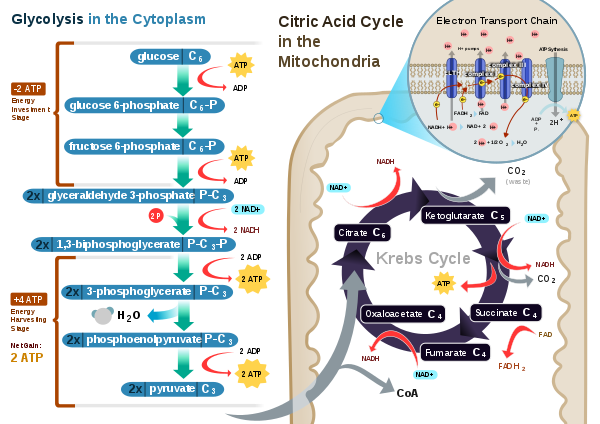 Respiration is one of the key ways a cell releases chemical energy to fuel cellular activity. Cellular respiration is considered an exothermic redox reaction which releases heat. The overall reaction occurs in a series of biochemical steps, most of which are redox reactions themselves. Although technically, cellular respiration is a combustion reaction, it clearly does not resemble one when it occurs in a living cell because of the slow release of energy from the series of reactions.